We are delighted to announce that Dr Pat Smith, Consultant Orthopaedic Surgeon from Missouri, has accepted Lifetime International Honorary Membership of the UK Biological Knee Society! Dr. Smith completed his medical training at the University of Michigan, followed by a sports medicine fellowship under Dr. Jack C. Hughston. Dr. Smith joined the Columbia Orthopaedic Group in 1986, where he specializes in arthroscopic surgery and sports medicine. He has served as the Head Team Physician for the University of Missouri since 1991. 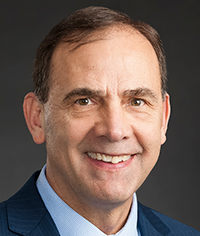 In 2010, Dr. Smith was appointed as the Director of the Sports Medicine Division at the University of Missouri in the Department of Orthopaedic Surgery, as well as co-director of the Sports Medicine Fellowship Program. Dr. Smith was inducted into the Missouri Sports Hall of Fame in 2015. 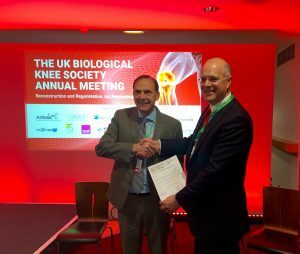 On behalf of the organising committee for the meeting, we would like to thank Dr Smith for his inspiring lectures, and on behalf of the whole UK Biological Knee Society, we are proud that Dr Smith kindly accepted Honorary Membership of our society.